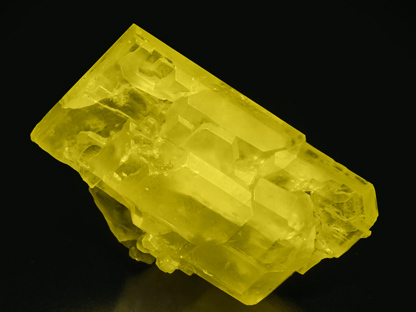 Polycrystalline growth of Sulfur crystals, one of them clearly dominant. They are very sharp, with very well defined faces and edges, translucent and bright. A nice "thumbnail". The crystal has very well defined faces and edges and it is on a small matrix of white scalenohedrons of Calcite. A Sicilian classic. 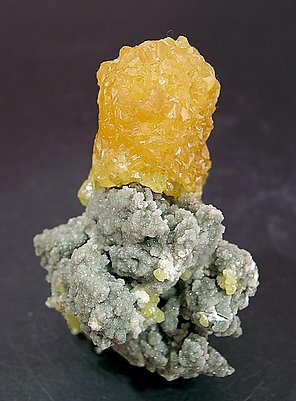 The crystals, on matrix, are dipyramidal, with echeloned growths. They have preserved, in spite of their age, their luster and color in very good condition. Druse, on matrix, of crystals showing very well defined faces and edges, between translucent and transparent and excellently preserved. 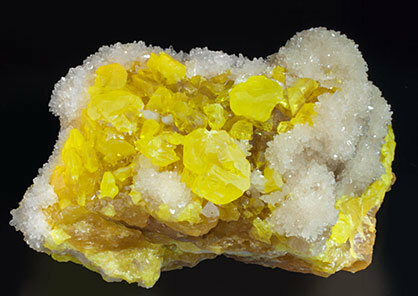 Bright small Sulfur crystals with very well defined faces and edges and deep hollowed growths. 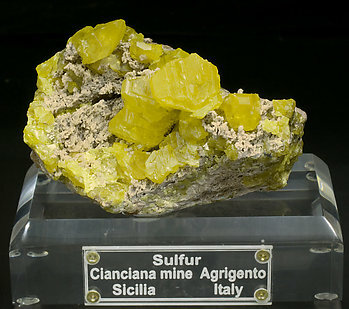 The Sulfur has been formed, very probably, at the expense of the deep blue crystalline Covellite that coats the matrix. Very unusual, as are many of the samples from this collection. 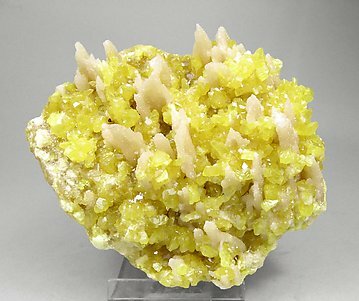 Sharp and well defined crystals, extraordinarily bright, with intergrowths of Aragonite and in matrix. From a locality classic for the species. A Sicilian classic. The dipyramidal crystals still have their excellent luster and color despite their age. 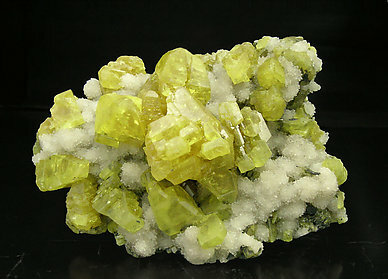 They are on matrix, with globular coatings of small white Calcite crystals. 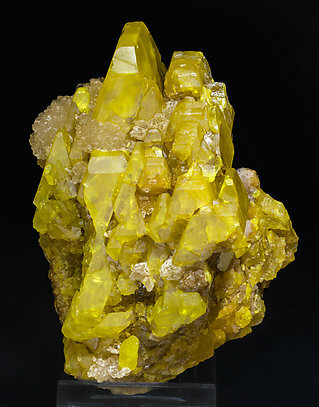 Group of Sulfur crystals with a flattened dipyramidal shape. 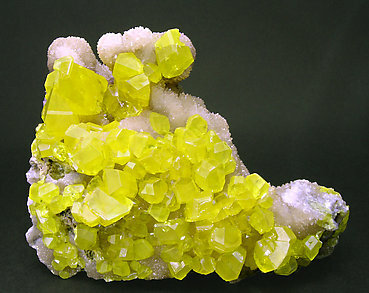 They are translucent, bright, and are on a Calcite matrix. A Sicilian classic. 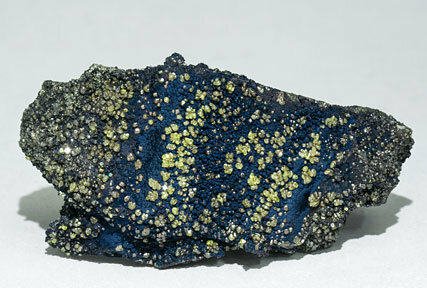 The dipyramidal crystals preserved, despite their age, their excellent luster and color. They are implanted on matrix, with globular coatings of small crystals of white Calcite. 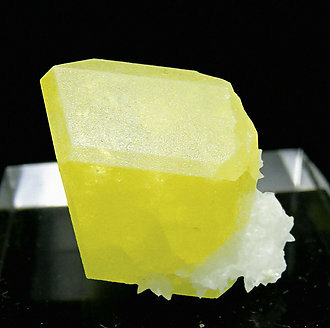 Balanced group of crystals of Sulfur on Calcite matrix. As is so often the case with this collection it was carefully selected to provide great pleasure. 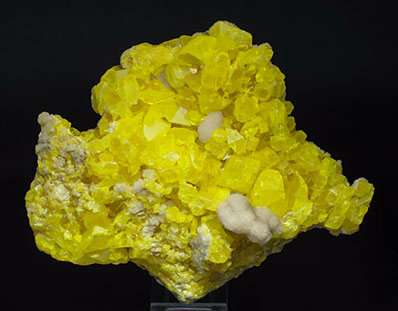 Excellent group of Sulfur crystals with an intense color and extraordinary luster, on a rich Calcite matrix. We call attention to this uncommon locality, where a small number of specimens were collected for a short time. 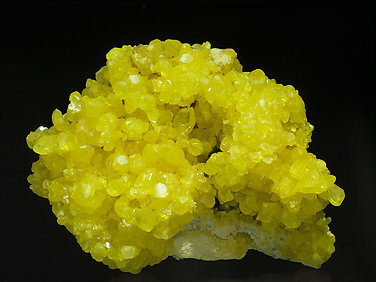 Groups of Sulfur crystals with very well defined faces and edges, bright, between transparent and translucent, on matrix and with spheroidal aggregates of small white Celestine crystals.